ReBBL News - Rise up and Leap Comrades! Fellow Kislev comrades, this is a message direct from our beloved Ice Queen. She wishes to praise the brave men, and ursine friends, for their battles against those forces that would see us toil in the fields, and stand in our way of achieving a great and glorious victory! 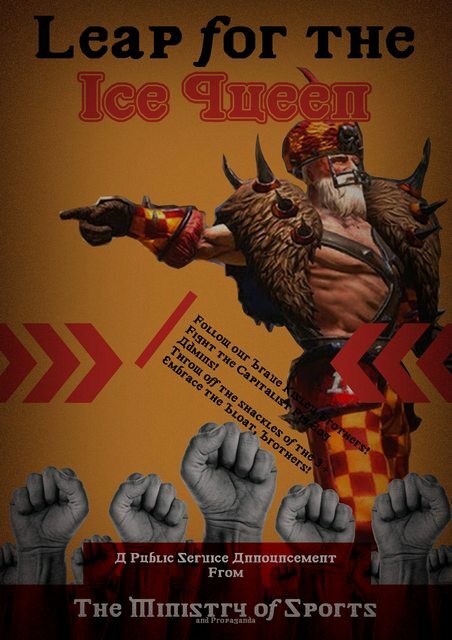 This season, 10 coaches have thrown off the shackles of their oppression and risen up to fight for the Ice Queen, and the superior Kislev way of life. While the road ahead will contain many struggles, it is our mighty Kislev spirit that will see us throw the troubles, see past the propaganda of the Capitalist Pig-Dog Admins, fight our way to victory over those who do not yet see the purity of our struggle, and give us the strength to show everyone the way to our Kislev utopia. The Kislev Ministry of Sports and propaganda will provide the disenfranchised Kislevites, toiling under the oppression of their would-be slave masters, frequent updates and advice on how to throw off the yoke of oppression, so that they too may fight for our Ice Queen and to spread the perfection that is our way of life! Stay strong my fellow Kislev coaches – know that your sacrifices are remembered and honored.